One monster that needs to be tamed daily is sorting mail! That would be the paper snail mail we get six days a week. 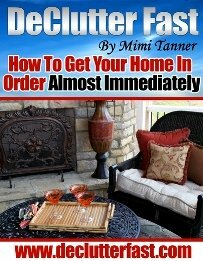 Most people bring it in the house and throw it in a pile on a table or countertop, depending what’s closest. If left unattended, the pile will grow. You could potentially miss paying bills and rack up late fees. Or, you could be unaware of a big fat check in there! Of course, there is plenty of junk mail that comes into our homes too. Here is an organized way of sorting mail to make sure everything gets dealt with appropriately and in a timely manner. Put together a small organizing station for sorting mail. You can use a small hanging file holder, or a small file box that holds folders. There are a lot of choices out there on the market, or you can probably even come up with something on your own. To File – papers that need to be filed in your main home filing system such as bank statements, medical results, etc. Actually, you can adjust the categories to suit your personal needs. I like to keep a folder just for receipts which I then enter into my money program on the computer regularly. You may want to keep a folder for kids school papers that need to be acted on, or one for someone else’s mail for them to go through themselves. When you come into the house with the mail, attend to it right away. It should only take a couple minutes. If there is something else urgent that needs to be taken care of, then do so, but get to your mail ASAP. Your mail sorting files should be near the door where you come in with the mail. For many of us, the kitchen counter seems to be where mail gets plopped down, so that’s a perfect spot. See what makes sense in your own home, a particular table, desk, etc. Open everything and make a decision on it right then and there. Put it into one of the file folders you labeled. Toss any junk mail into the garbage or recycle bin that should be keep close by. Another great thing to have on hand if possible is a small shredder. That way you can deal with items that need to be destroyed to protect your identity right away. Otherwise, you can put them into that file labeled “To Shred” and take care of them on a regular basis when the folder starts to get a little full. This system for sorting mail is great for keeping your incoming mail under control, but it still requires you to be an active participant! 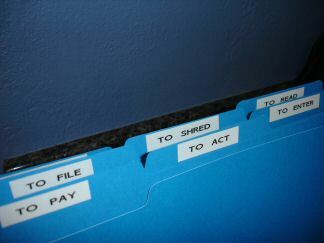 You need to keep up with it, and you need to make sure you deal with the file folders regularly. What good is a “To Pay” folder if you never go in and pay those bills! This system will prevent piles of unopened mail growing across your counters and flat surfaces. It will also keep important mail together for you to act on it when you’re ready. Make this part of your daily routine and in no time, it’ll be as natural as brushing your teeth! Privacy Rights Clearinghouse Detailed information about privacy rights and how to reduce your junk mail. Privacy Rights Clearinghouse is a Nonprofit Consumer Information and Advocacy Organization. Catalog Choice A free service that lets you communicate your mail preferences to companies. Choose which catalogs you no longer wish to receive. Reduce the amount of unsolicited mail in your mailbox and go paperless. TreeHugger Shows you ways to stop junk mail, either on your own or with the help of certain organizations and gives the pros and cons of each.